Milder weather combined with plentiful renewable power supplies to drive power prices lower across the West in May, both on a month-to-month and year-to-year basis. For example, heating and cooling degree days in May in the California Independent System Operator were down by about 47.5% from April, and down about 37.5% from last May, according to S&P Global Platts Analytics data. Also, solar generation in California continued to make strides, with combined photovoltaic and thermal solar generation surpassing natural gas-fired generation on a monthly basis for this first time on record. In Cal-ISO, NP15 spot prices saw the largest year-to-year decrease, down about 32% from the $31.75/MWh averaged last May to $21.50/MWh this May. Combined photovoltaic and thermal solar generation in Cal-ISO territory averaged 97,504 MWh/d in May, up from the 87,285 MWh/d averaged in April and 9.7% above the 88,878 MWh/d averaged last May. Total solar generation also hit an all-time high on May 28, reaching 109,581 MWh. However that record was just broken on June 1 when combined solar generation climbed to 111,742 MWh. Additionally, after setting several records in April, solar generation broke some of those records in May, setting a new instantaneous maximum demand served by renewables record on May 26, serving 73.9% of demand. 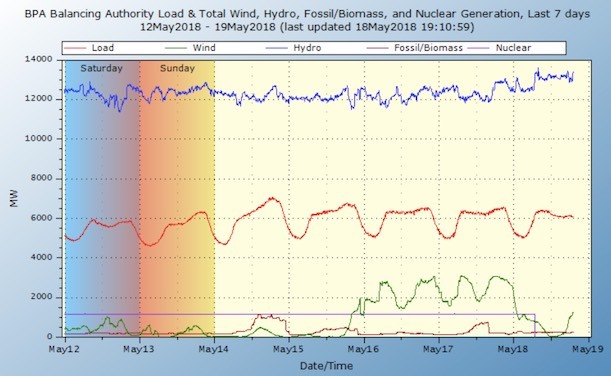 An instantaneous maximum demand served by solar and wind record of 64.6% and a record for the all-time instantaneous solar generation peak 10,634 MW were set on May 28. However, the instantaneous solar generation peak record has since been broken, reaching 10,723 MW on June 4. Thermal generation fell below total solar generation for the first time on record, averaging 86,023 MWh/d in May, down about 21% from the 108,594 MWh/d April. In the Northwest, Mid-Columbia day-ahead on-peak prices averaged $12.75/MWh in May, about 27% below the $17.50/MWh averaged in April, due in part to continued weak demand in the region. Spot prices at the California-Oregon Border had the least decrease of the five regional power hubs included in this analysis, falling just 9.75% to averaged $19.75/MWh in May, and falling about 17% from the 23.75/MWh averaged last May. Data from the Bonneville Power Administration shows peakload averaging 6,516 MW in May, down from the 7,054 MW averaged in April and just below the 6,545 MW averaged last May. Hydro generation in BPA territory averaged 304,830 MWh/d, accounting for 85.8% of total generation in May, about 24% above the 246,136 MWh/d averaged in April when hydro generation accounted for 77% of total generation. Last May hydro generation averaged 292,742 MWh/d during the strong water year. Flows at The Dalles Dam on the Columbia River averaged 125% of normal in May, up from the 120% of normal averaged in April, but just below the 128% of normal averaged last May. Energy Northwest's Columbia Generating station went offline for five days in the middle of the month after "one of the station's main power transformers automatically disconnected from the transmission system following a grid disturbance." Thermal generation also fell in BPA's footprint, averaging 6,329 MWh/d in May, about 60% below the 15,486 MWh/d averaged in April and below the 14,926 MWh/d averaged last May. In the Southwest, Palo Verde day-ahead on-peak averaged $22/MWh this May, 12% below the $25/MWh averaged in April and down about 23.75% from the $28.75/MWh averaged last May. Platts Analytics data shows temperatures near the Phoenix, Arizona, airport weather station averaged about 84 degrees in April, above the high of 77 degrees averaged in April as well as the high of 82 degrees averaged last May.